Taipei, Sept. 18 (CNA) Chinese American historian Yu Ying-shih expressed hope Thursday that the Tang Prize awards will attract more young talent to the study of sinology and bring new perspectives to the field. 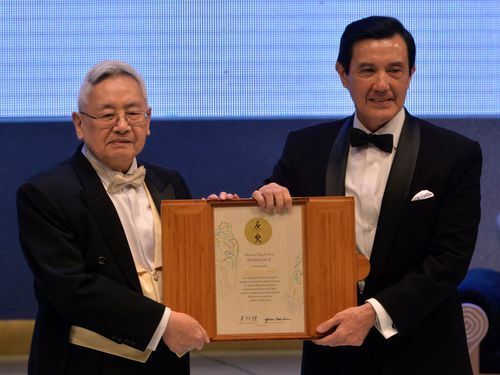 "To be awarded the inaugural Tang Prize in Sinology is the greatest honor I have received in my life," Yu said during his acceptance speech at the first Tang Prize award ceremony in Taipei after receiving the medal and diploma from President Ma Ying-jeou. The 84-year-old Princeton University emeritus professor said he believes sinology as a scholarly endeavor is more in need of encouragement and support "now than ever before." The study of sinology has undergone a "gradual but very significant" transformation in recent decades, with more and more sinologists interested in understanding the growth of Chinese civilization on its own terms rather than interpreting it according to the historical model of the West, he said. That should not be mistaken, however, as advocacy of isolationism, Yu said, stressing that sinology has become "thoroughly globalized" today, unlike in the first half of the 20th century. He said it is his earnest hope that the Tang Prize "may serve to attract more young talents with vibrant minds that will bring fresh perspectives to the sinological world." Yu is regarded by many of his peers as the greatest Chinese intellectual historian of his generation. He brought previously neglected aspects of Chinese history into mainstream scholarship and has been credited with rescuing the Confucian heritage from "caricature and neglect" and stimulating younger scholars to rediscover the richness and variety of Chinese culture after the ravages of Mao Zedong's Cultural Revolution, according to the U.S. Library of Congress. Over the past 60 years, the China-born scholar has published around 60 books and hundreds of essays in English and Chinese. In 1976, he published the essay collection "Li Shi Yu Si Xiang" ("History and Thought") in Taiwan, which went on to become one of his most influential works. The collection highlights the interconnectedness of Chinese literature, history and philosophy, as well as the similarities and differences between Western and Eastern thought. Yu is particularly known for his research on the tradition of public intellectuals and the evolution of their identities and statuses. In a breakthrough research project, he counted Buddhist monks of the Northern and Southern dynasties and Sui and Tang dynasties among the public intellectuals, a pioneering concept at the time of its publication. Yu's research on major Chinese intellectuals, including Fang Yizhi and Zhu Xi, have also reshaped the way scholars understand these figures in Chinese history.